Here at TomatoInk.com we believe in corporate responsibility. 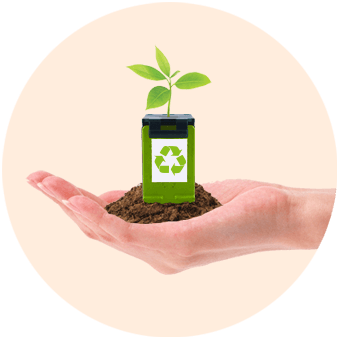 We aim to take an Earth-friendly approach to all of your printer-related supplies by teaming up with tree planting partnerships. Currently, with our Eden Reforestation Projects partnership, ten trees are planted with every order. So you can feel good knowing that each page you print is a little greener because you contributed to replenishing its source. The non-profits we have partnered with are Eden Reforestation Projects and OneTreePlanted. Both of these share the mission to fight deforestation by planting trees around the world, but they each have their own unique take on the process. Learn more about each of these amazing non-profits below. Eden Reforestation Projects is a 501(c)(3) nonprofit that plants millions of trees every year on the behalf of donors, businesses, and foundations. For every donation given to Eden Reforestation Projects, 10 trees are planted. Eden's roots began in Ethiopia in 2004 under the leadership of Dr. Steve Fitch. While in Ethiopia, Dr. Fitch witnessed villages that had been destroyed by deforestation. Many of the villagers, who had been raised over many generations in these areas, were now being threatened with relocation to refugee camps. He launched "Eden Reforestation Projects" in order to try and reverse environmental devastation that negatively impact families and local culture. Now, as a non-profit in the US, Eden Reforestation Projects is successfully reducing extreme poverty and restoring healthy forests. Their objective, which they hope to achieve by the year 2020, is to plant a minimum of 100 million trees each year and to offer hope through the employment of tens of thousands of people in countries where poverty is rampant. We hope to help them reach their goal. OneTreePlanted is a non-profit 501(c)3 on a mission to reforest our planet and provide education, awareness, and engagement on the importance of trees. They make it simple for individuals, businesses, and schools to plant trees. Established by founder and Chief Environmental Evangelist Matt Hill in Shelburne, Vermont, OneTreePlanted was created to be a voice for organizations that want to give back to our Earth for no gain of their own. Planting trees has been their passion from the very beginning in 2014. Today, OneTreePlanted has grown to be a global presence in the fight against deforestation. They’ve adopted the 80/20 model, in which 80% of their revenue goes directly to tree planting, and 20% goes toward developing and growing various programs. Making tree planting accessible for everyone, their peer-to-peer platform empowers individuals to get involved and share with their community. OneTreePlanted also collaborates with schools and businesses across five continents. They are constantly working to find new ways of inspiring people to plant trees and make a brighter future.